Greetings explorers! Over the next several weeks we’ll be giving you a better look at some of the features of Hades’ Star. This week we’ve decided to discuss the early stages of the game as well as some of info you’ll need to do to survive and triumph in the cold, unforgiving vacuum of space. If you’re completely new to the world of Hades’ Star, your mission is one of expansion through the colonization of planets, the building and upgrading of your fleets and the defense of your acquired territory from constant Cerberus threats. There is a lot to do, and a whole lot of space to explore and conquer. We’ll start off by discussing the basics of the Hades’ Star economy. There are three types of currency you’ll have to manage and obtain in game, Credits, Hydrogen, and Crystals. Each one is vital to your success and can be obtained in a variety of different ways. CREDITS: Credits are your main currency, used to buy ships and build infrastructure. Quite simply, building a space empire is expensive and will cost you a ton of credits. Credits are obtained through (mostly) safe trade done by your fleet’s transport ships. The more transport ships and cargo space at your disposal, the faster you’ll gain credits. Simply direct your transport ship to a colonized world or moon, select shipments, and see what goods need a delivery. The amount of credits gained through trade is typically linked to the distance traveled by your transports, so long journeys typically yield more credits. TIP: Once your transports can carry multiple shipments, always keep an eye out for goods that can be delivered to the same, or nearby, planets or moons. You’ll get more credits and will travel the same distance! 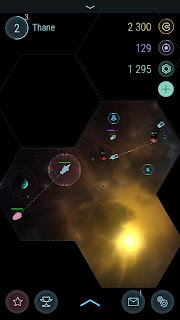 HYDROGEN: Hydrogen is your main fuel source and is consumed when moving ships around a star system. The more ships you have in your fleet, the more rapidly you’ll consume your hydrogen supply. Hydrogen can be gained through mining, so having a few nearby asteroid fields is great for quick hydrogen production. Miners will also continue to mine an asteroid field until it is depleted, so keeping your hydrogen supply up early in the game is typically not an issue. TIP: Moving around your own system doesn’t cost a ton of hydrogen, but jumps to Red Star systems can be quite expensive. Make sure you have plenty of hydrogen available before attempting numerous jumps with a large fleet. CRYSTALS: Depending on how much time you have available to you, crystals can be used to speed up various in-game operations (such as the discovery of a new sector, the upgrading of a station or the construction of a new module or station). Crystals can also be used to buy Credits and Hydrogen, should your supply be running low. TIP: While crystals are typically obtained more slowly than hydrogen or credits, don’t be afraid to use them to speed some things up! Also, don’t forget that crystals can also be earned through trade done by your transport ships. We hope you enjoyed learning a bit more about the economy of Hades’ Star. In the coming weeks, we’ll be digging into the various ships, modules, stations, enemies, and combat that you’ll find in the game. Make sure you follow us on Twitter @HadesStarGame and say hi! Hi can you explain in detail how to make money from shipments? I know the resources are being generated at the moons and you can load them to the transporters but what then? I would really appreciate your input as I have no clue. I dump the resources on the planet and they just sit there stashed. No income at all.